There are two false approaches to the life around us that many often make today, thinking that somehow this is what Orthodox Christians should be doing. One approach — the most common one — is simply to go along with the times: adapt yourself to rock music, modern fashions and tastes, and the whole rhythm of our jazzed-up modern life. Often the more old-fashioned parents will have little contact with this life and will live their own life more or less separately, but they will smile to see their children follow after its latest craze and think that this is something harmless. This path is total disaster for the Christian life; it is the death of the soul. Some can still lead an outwardly respectable life without struggling against the spirit of the times, but inwardly they are dead or dying; and — the saddest thing of all — their children will pay the price in various psychic and spiritual disorders and sicknesses which become more and more common. One of the leading members of the suicide cult that ended so spectacularly in Jonestown four years ago was the young daughter of a Greek Orthodox priest; satanic rock groups like Kiss — "Kids in Satan's Service" — are made up of ax-Russian Orthodox young people; the largest part of the membership of the temple of satan in San Francisco, according to a recent sociological survey — is made up of Orthodox boys. These are only a few striking cases; most Orthodox young people don't go so far astray — they just blend in with the anti-Christian world around them and cease to be examples of any kind of Christianity for those around them. This is wrong. The Christian must be different from the world, above all from today's weird, abnormal world, and this must be one of the basic things he knows as part of his Christian upbringing. Otherwise there is no point in calling ourselves Christian — much less Orthodox Christians. The false approach at the opposite extreme is one that one might call false spirituality. As translations of Orthodox books on the spiritual life become more widely available, and the Orthodox vocabulary of spiritual struggle is placed more and more in the air, one finds an increasing number of people talking about hesychasm, the Jesus Prayer, the ascetic life, exalted states of prayer, and the most exalted Holy Fathers like St. Symeon the New Theologian, St. Gregory Palamas, and St. Gregory the Sinaite. 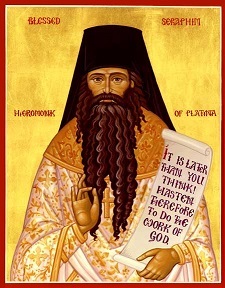 It is all very well to be aware of this truly exalted side of Orthodox spiritual life and to have reverence for the great saints who have actually lived it; but unless we have a very realistic and v very humble awareness of how far away all of us today are from the life of hesychasm and how little prepared we are even to approach it, our interest in it will be only one more expression of our self-centered, plastic universe. "The me-generation goes hesychast!" — that is what some are trying to do today; but in actuality they are only adding a new game called "hesychasm" to the attractions of Disneyland.